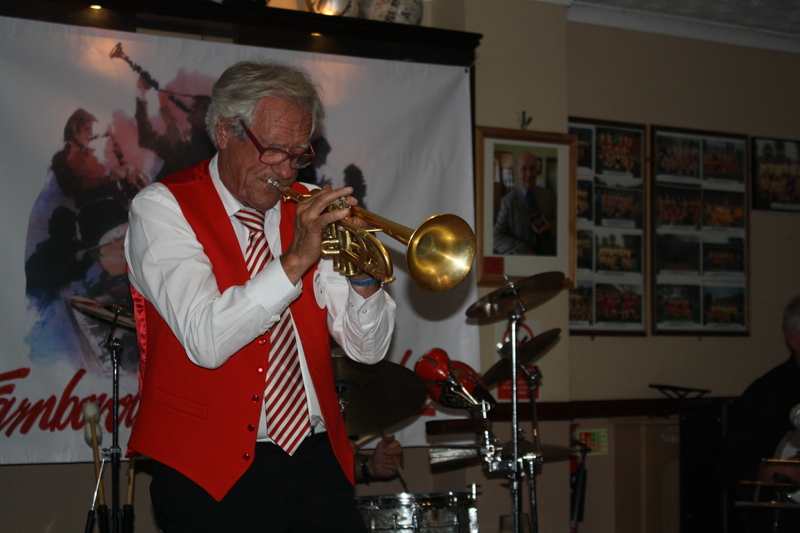 Dave Rance on trumpet with his Rockin’ Chair Jazz Band at Farnborough Jazz Club (Kent) on 12th June 2015. Photo by Mike Witt. 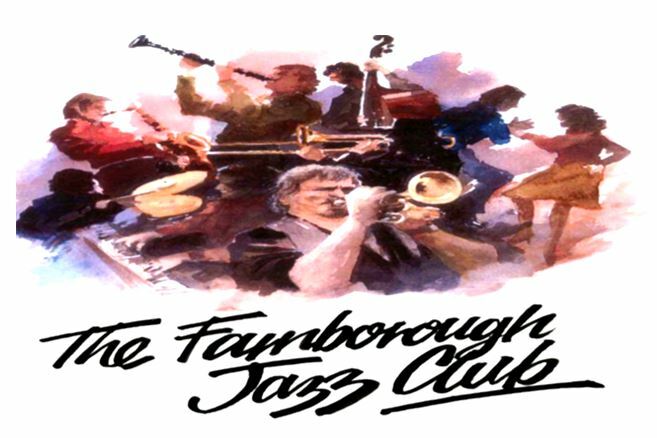 DAVE RANCE’S ROCKIN’ CHAIR BAND will be back at FARNBOROUGH JAZZ CLUB on Friday, 3rd February 2017 from 8:00pm till 11:00pm. Band leader, DAVE RANCE (trumpet & vocals) has booked DEREK SCOFIELD (clarinet, alto, tenor and bass saxes plus piccolo & vocals, and may well do a little bit of tap dancing too), plus CHRISTINE WOODCOCK (trombonist & vocals) and also MIKE BREWERTON (double bass), DOUG PARRY (banjo & guitar) and HENRY HARRISON (drums). Christine runs her own band called ‘Stackyard Stompers’. It is her first time here, so please give her a warm Farnborough welcome. Certainly this promises to be a thoroughly enjoyable fun-filled evening, so why don’t you get your bodies over for a taste. We would like to see you all back to make up for the recent bad weather, supporting this happy little club of ours. Usual time – 8:00pm till 11:00pm – plenty of parking space and club price bar. This entry was posted in Dave Rance's Rockin' Chair Band on February 2, 2017 by Diane. 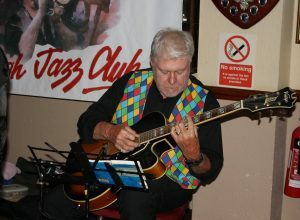 DAVE RANCE’S ROCKIN’ CHAIR BAND was our ‘LIVE’ entertainment at FARNBOROUGH JAZZ CLUB on Friday, 10th June 2016 8:00pm. 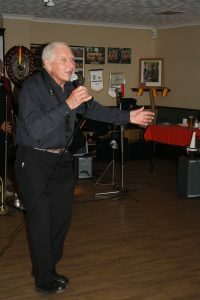 Band leader, DAVE RANCE played trumpet and sang, with DEREK SCOFIELD, who also sang. 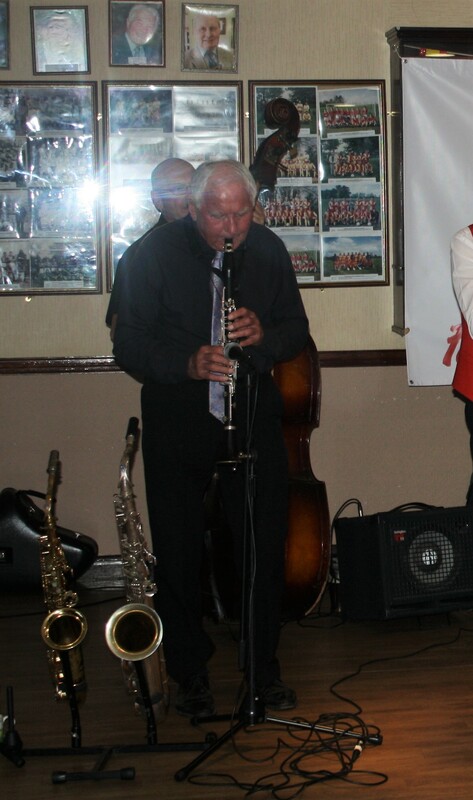 DEREK also played clarinet, saxophone, tenor and bass saxes, plus piccolo, as well as a little bit of tap dancing (and he is in his mid-80’s too – what a star). GRAHAM WISEMAN was their trombonist (yes, another vocalist) HENRY HARRISON played drums, with MIKE BREWERTON on double bass and DOUG PARRY on banjo and guitar. 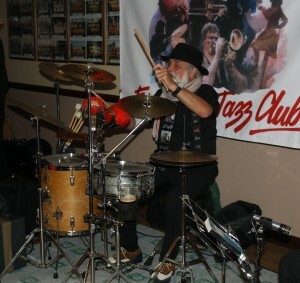 Dave Rance’s Rockin’ Chair Band at Farnborough Jazz Club (Kent) on Friday 10th June 2016. (LtoR) Mike Brewerton (d.bass), Derek Scofield (reeds)Henry Harrison (drums), Dave Rance (trumpet), Doug Parry (banjo/guitar) & Graham Wiseman (trombone). Photo by Mike Witt. Such a lot of fun, but with not too many people, although those who were there, enjoyed it. 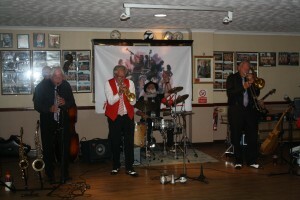 They began the evening with one of Louis Armstrong’s numbers – ‘Too Busy’, a lovely happy tune. It was followed on with ‘No-body’s Sweetheart Now’. Derek sang from the middle of the dance floor – a lovely act. Then they all played ‘Creole Bells’ wonderfully – Doug played a lovely solo on banjo. Doug Parry plays guitar for Dave Rance’s Rockin’ Chair Band at Farnborough Jazz Club (Kent) on Friday 10th June 2016. Photo by Mike Witt. ‘Engine’ of Dave Rance’s Rockin’ Chair Band at Farnborough Jazz Club (Kent) on Friday 10th June 2016. 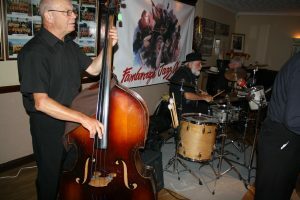 (LtoR) Mike Brewerton (d.bass), Henry Harrison (drums) and just visible – Doug Parry (banjo). Photo by Mike Witt. Dave took to the ‘mike’ next, singing ‘If I Had A Talking Picture Of You’, with Henry on drums … standing whilst playing … I think quite unique with trad’ jazz bands. (Dave used a mute on trumpet). He then played again some wonderful trumpet to Louis’ ‘When It’s Sleepy Time Down South’, a lovely number. 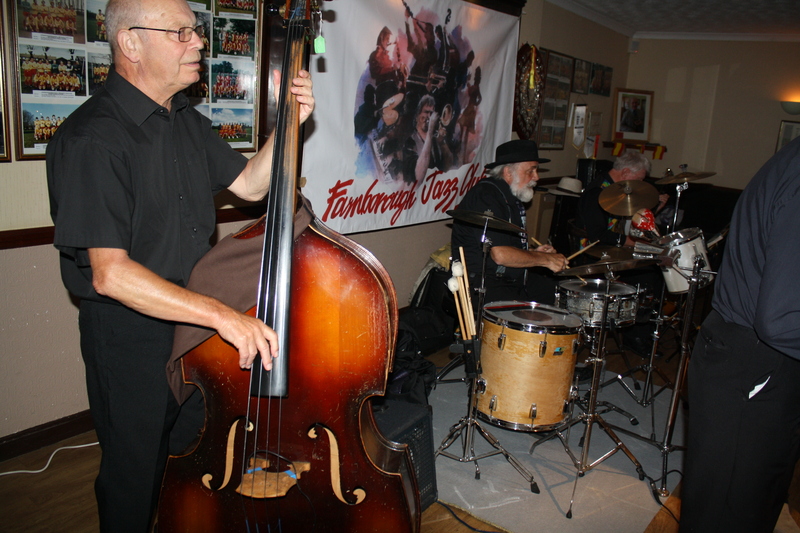 Dave Rance’s Rockin’ Chair Band front line at Farnborough Jazz Club (Kent) on Friday 10th June 2016. (LtoR) Derek Scofield, Henry Harrison, Dave Rance and Graham Wiseman. Photo by Mike Witt. Graham sang (great too) next with ‘Irish Black Bottom’, echoed by Dave, which lured our-line dancers onto the floor. We had so many away, so it was begun by two of our gents, but they were soon joined by two of us females! Yes, just four of us!!!!!!!! But we carried on uninhibited – ha. This was all followed by Dave’s featuring with that Bix Beiderbeck tune, ‘Davenprt Blues’. Well done Dave, super-duper trumpet. Must mention a fabulous drum solo from Henry with ‘Moose March’. Stumbling’ was a feature for Derek and, once again, did he ‘perform’. He played clarinet and then stepped out into the middle of the floor, singing, whilst tap dancing. Oh what a lovely man, with so much talent. There were more songs, but Derek was featured again, this time on sax with ’Singing The Blues’, some great guitar playing from Doug and the dance floor was in full use. 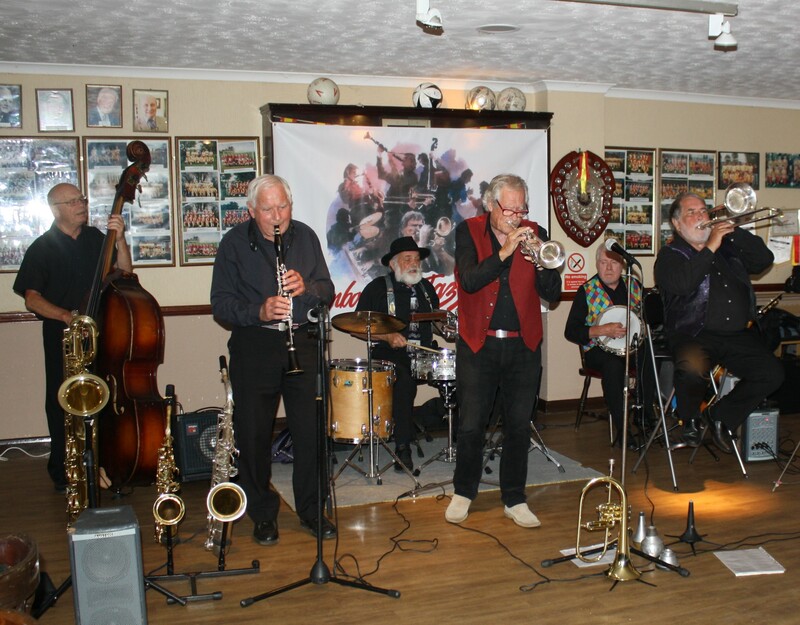 Dave Rance’s Rockin’ Chair Band at Farnborough Jazz Club (Kent) on Friday 10th June 2016. 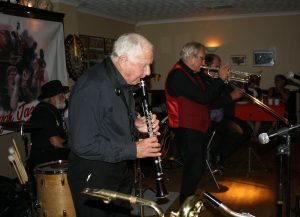 (LtoR) Henry Harrison (drums), Derek Scofield (clarinet), Dave Rance (trumpet) & Graham Wiseman (trombone). Photo by Mike Witt. Their last number was sung by Dave, being ‘Down By The Riverside’. Henry performed a great drum solo again, with Derek playing tenor, clarinet and piccolo! What a way to end an evening. Thank you everyone, our audience remarked how wonderful you all played. We keep jazz ‘Live’ here. This entry was posted in Dave Rance's Rockin' Chair Band on June 15, 2016 by Diane. 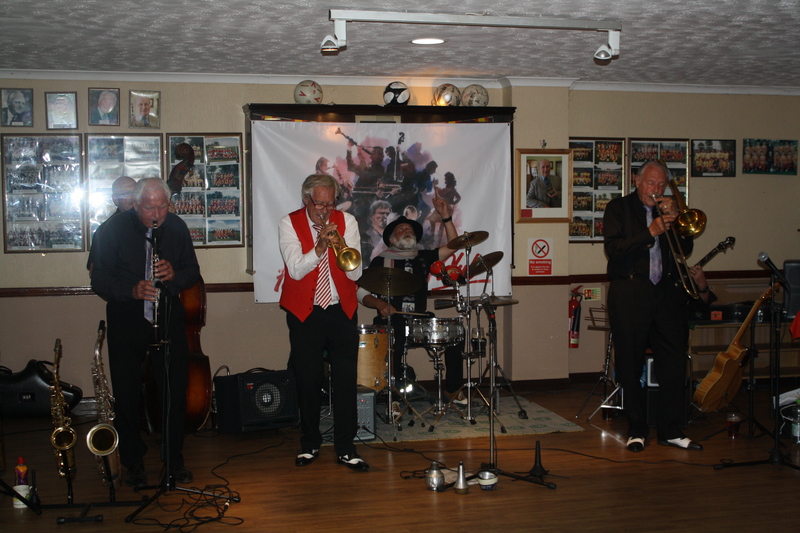 FARNBOROUGH JAZZ CLUB enjoyed the booking with DAVE RANCE’S ROCKIN’ CHAIR BAND on Friday, 12th June 2015. They looked great, played great and sang great. 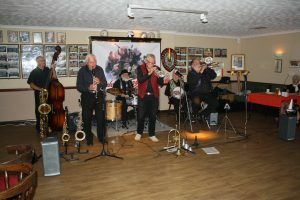 DAVE RANCE (trumpet&vocs) was joined by DEREK SCOFIELD (sax & clarinet), BRIAN WEBB (trombone), HENRY HARRISON (drums), MIKE BREWERTON (d.bass) and DOUG PARRY (banjo). 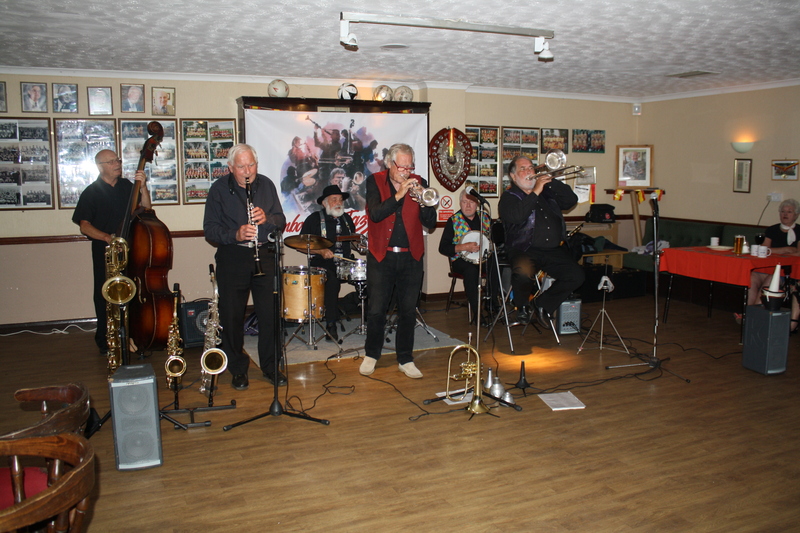 Dave Rance’s Rockin’ Chair Band at Farnborough Jazz Club (Kent) on 12th June 2015. 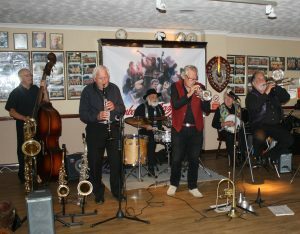 (LtoR) Mike Brewerton (d.bass), Derek Scofield (reeds), Dave Rance (trumpet), Henry Harrison (drums), Brian Webb (trombone) and (hidden) Doug Parry (banjo). Photo by Mike Witt. They played some wonderful tunes and my first number to mention is ‘Bourbon Street Parade’, a great favourite, sung by Brian, with Dave harmonizing. This number encouraged our Steve to get his umbrellas for the brolly parade, just wonderful. 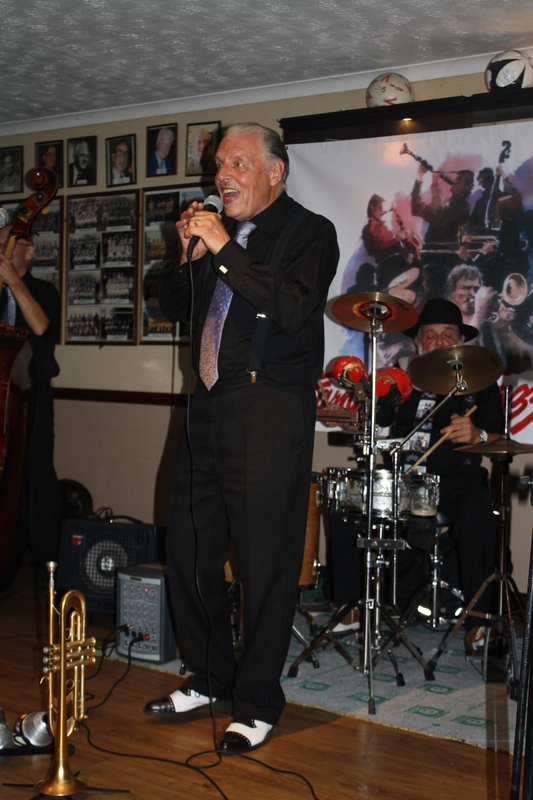 Brian Webb sings with Dave Rance’s Rockin’ Chair Band at Farnborough Jazz Club (Kent) on 12th June 2015. Photo by Mike Witt. Brian sang again my next choice – ‘Nobody’s Sweetheart Now’. He sure does have an excellent voice. Oh and what about ‘Whistling Rufus’? Not sure that has been played here before. A lovely old ‘Glen Miller’ favourite of mine came next, being ‘Johnson Rag’, superb playing by Derek on baritone sax – another lovely one to dance to. We joined in singing ‘Ace in the Hole’, then Dave was featured with the next number, with Brian singing ‘That Old Feeling’. We performed our line-dance to the next one, ‘Shimmy-Sha-Wobble’, great fun. 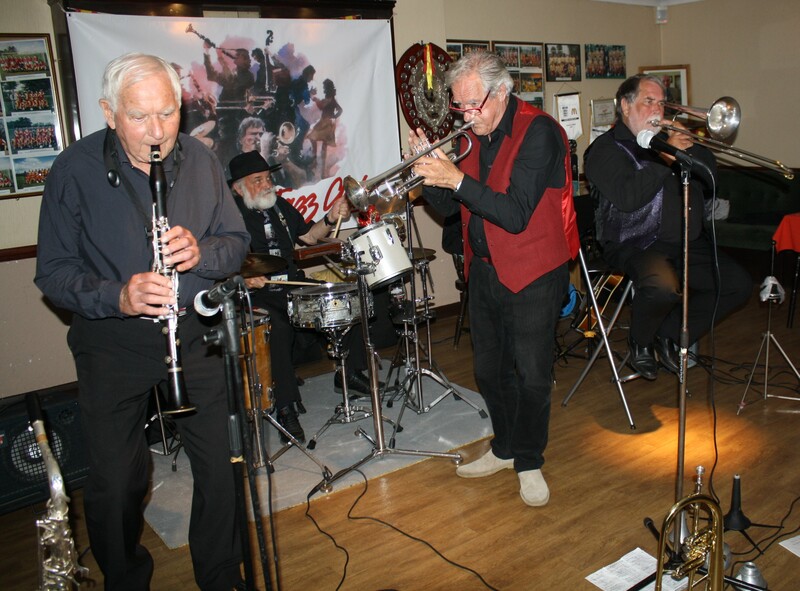 Derek Scofield plays clarinet with Dave Rance’s Rockin’ Chair Band at Farnborough Jazz Club (Kent) on 12th June 2015. (hidden is Mike Brewerton on d.bass). Photo by Mike Witt. Henry Harrisson on drums with Dave Rance’s Rockin’ Chair Band at Farnborough Jazz Club (Kent) on 12th June 2015. Photo by Mike Witt. 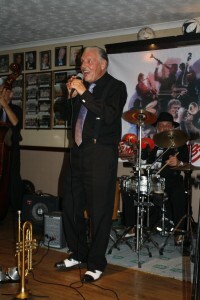 This entry was posted in Dave Rance's Rockin' Chair Band on June 15, 2015 by Diane.